The Nabisco 100 calorie snack pack takes it for Worst Snack of 2010! Use too much packaging (bad for the environment). Have almost zero nutritional value. Trick you into thinking you did something healthy (just 100 calories!). Are expensive ($3.00 a box). What else can I say? These are a crappy choice in a world of much better choices for packaged snacks. See my list here of healthy packaged snacks: Healthy Packaged Snacks. Please share your nominees for the worst snack of 2010. Sad to say, I'm going with the Girl Scout's Thin Mints. 1. When the girls knock on your door, of course, you have to purchase a few boxes. It's un-American if you don't. 2. While the cookies taste great, they are loaded with trans fats. Of course, a known killer. So unbeknownst to the patriotic American is that the scouts are pedaling artery-clogging foodstuffs. Yeah, They are a tasteless waste of time. You need to do some research BEFORE you open your mouth! While I totally agree that Girl Scout cookies are not health food by any means and should be eaten in moderation (if at all), they do NOT 'loaded with trans fats' as you wrote. "Q: What about partially hydrogenated oils (trans fats)? A: Girl Scouts of the USA is proud that all Girl Scout cookies are "zero trans fat per serving" with the same great taste that has made them one of America's favorite treats over the years. All varieties contain less than 0.5 grams trans fat per serving, which meets or exceeds the FDA guidelines for the "zero trans fat" designation. For the first time this year (2010-2011 season), most varieties of Girl Scout Cookies from Little Brownie Bakers contain 0 hydrogenated oil. Girl Scouts of the USA has worked diligently with our bakers over the past several years to address the issue of trans fats. We began listing the amount of trans fats one full year before FDA requirements went into effect. It is important to remember that Girl Scout Cookies are a snack food and are meant to be consumed in limited quantities within the context of a balanced diet. So that consumers can make an informed choice, the ingredients and nutritional profile of each variety are clearly listed on both the cookie box and the cookie order form, and also on the Web at www.girlscoutcookies.org." I have absolutely no affiliation with this organization, etc. It just really really annoys me when people have blogs and are irresponsible with facts and information. 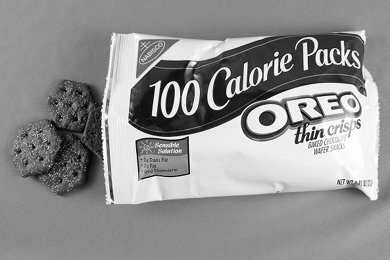 for the most part...all these 100 calorie packs from Nabisco and other huge bakers...are just awful. who cares about the low calories...I wouldn't waste my time eating these. Oh, AMEN, Snack Girl. When these things came out, it was like the best. thing. ever. Until I finally decided to look at the back of the package (mind you, I was young, stupid and in college at the time) and see that they were NOT the fun, awesome, brilliant "snack" I once thought they were. They're sneaky enough to make you feel like eating one or two packs is ok... until you, um, look at the amount of sugar & fat is in them!! Oh, and don't even BOTHER talking about the ingredients. I'd rather indulge myself with one or two oreos than think I'm doing myself a favor by grabbing one of these packs. Great pick, Snack Girl! Happy holidays! I agree with this. PS if you want chocolatey low fat cookies, MUCH better are the chocolate Trader Joe's "Cats Cookies for People" cookies. Much more chocolatey, not full of unpronounceables, and you can just count out the cookies that are a serving yourself or leave out a few if you are obsessed with making the 100 calories or under number... Quite honestly, even a petite person can eat more than 100 calories for a snack if the meals are cut down to compensate. No one needs to have a 500 calorie snack (unless you're an Olympic athlete who eats ginormous amounts of calories a day)--but if you can't portion out your own small servings, you're a 4 letter word : L-A-Z-Y. In moderation, there is nothing wrong with these snacks. There are no good and bad calories. There is just energy, which some people use more than others. For those on higher calorie diets who cover all their nutritional bases with the usual assortment of superfoods, discretions and indulgences are awsome. Don't hate.